I have just arrived in the capital city of the Sultanate of Oman for a three-week stay. My charge is to experience and eventually to document and interpret aspects of music and the performing arts in this country, one that is unique among those of the Arab world. I have arrived during the celebrations for National Day and, from the publicity I have seen so far, it seems as though music, dance, parades, concerts and exhibitions are ongoing throughout the country. The buildings and streets are bedazzled in florescent lights and congratulatory signs with pictures of the handsome Sultan Qaboos hung everywhere. At least these were my observations during the 20-minute drive from the airport to the hotel last night. National Day, which generally occurs around November 18th, is a very special occasion this year as it is the 40th anniversary of the year that His Majesty Sultan Qaboos bin Said assumed the position of sovereign leader of Oman and brought this Arabian Gulf country into the 20th century. Extraordinary strides have been made as basic infrastructure, education, health care, and business and civic institutions emerged in a relatively short time. And in the Omani sprint to join its modern sister nations in the region, the arts have not been left behind. In fact, the Omani artistic renaissance, which has been on-going since the 1970s, has enhanced the flowering and dissemination of both traditional and international arts in Oman by providing robust patronage and proactive initiatives in artistic exchange that are multinational in scope. The country’s institutions and projects indicate that Oman is perhaps the only country in the Arab world, in the Muslim world, and among the Gulf States that possesses both visionary support and promotion of the arts and the means to sustain arts patronage on such a grand scale. I have been exposed to the recordings of folkloric ensembles that preserve various styles of music and dance through documentation that has been sponsored by the Center for Traditional Music, established in 1984. A handful of ethnomusicologists (for example, Dieter Christensen, Salwa al-Shawan Castello Branco, and Issam al-Malah) have accomplished excellent research with this archive. And in 2005, I, along with about a million Washington DC natives and tourists to the capital witnessed some of these kinds of performances at the Smithsonian Folklife Festival, which, in 2005 hosted over 100 performers and artisans from the Sultanate of Oman. While Oman is rarely the Arab world country that we hear about in the news, it is significant that Oman was the first Arab nation to be featured at the Smithsonian’s 39th annual festival of international arts and culture. Again, Oman’s participation in the Folklife Festival could only have happened with the phenomenal support of His Majesty Sultan Qaboos bin Said. 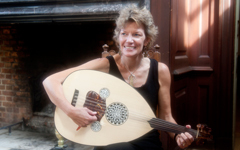 •Information on the Center for Traditional Music in Oman may be found at http://www.octm-folk.gov.om/meng/default.asp. •Comprehensive information on the Smithsonian Folklife Festival may be seen here: (See: http://www.festival.si.edu/). •See for example, http://www.middle-east-online.com/english/?id=33994, and http://www.eturbonews.com/15064/grand-opera-house-coming-oman, for stories on the orchestra and opera house. •The website of the Sultan Qaboos Cultural Center in Washington, D.C. may be seen here: http://www.mei.edu/SQCC.aspx. What a joy to journey with you vicariously via this blog. A rich experience for me.